I have spent the better part of 2017 serving as a Youth Corp Member; and with less than two months to complete this phase, I have experienced great tension on what life could hold after this. There is the fear of the labor market and what it has to offer, or what it wouldn’t offer at all. The idea of job seeking is frightening and to help us escape this fear, entrepreneurship has been preached to us at workshops as the most strategic escape from serving others. Some speakers will go as far as telling you, if you have an idea and a proposal, you will do just fine. The push for entrepreneurship is loud, and tips are everywhere on the values of self-employment. While independence is a great thing, it is scary too. We often ignore that there is also a depth of assurance that could come from being an employee. Entrepreneurship does look glossy on the outside; personally, I have no qualms working for others, building confidence, learning and strategising on what my own independent future would look like. In 2013/2014 there were new inventions on how to get employed; some job seekers snatched social media by standing on the roadside with placards that read their CVs. This method was successful for some. It was a new method of challenging the difficulty of applying for jobs, especially in a country where many other people have similar qualifications and are going through the same process to get the same job. On days when what you learnt at school is not enough to secure the job, other skills could offer a new beginning, and it is what Director, Asurf Oluseyi takes as inspiration for his new film. 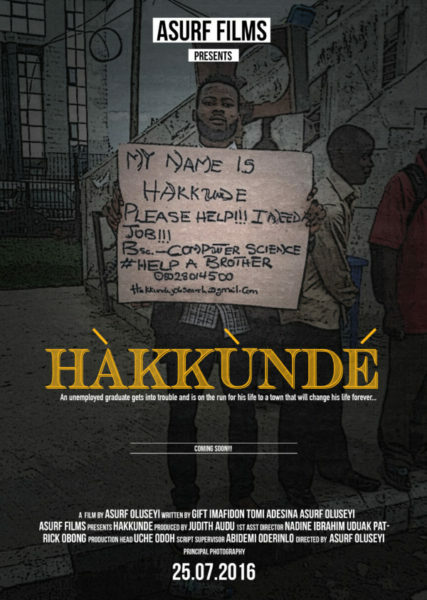 Asurf and his writers make exclusive use of the 2013/2014 viral job seeking phase to create a film called Hakkunde. It dramatizes the story of Akande (Kunle Idowu), a jobless Animal Science graduate from a Nigerian university. Akande struggles to find a good job, and while waiting for his dream job he seeks attention from recruiters by holding a placard on the roadside, and soliciting for attention on Facebook with the help of his ailing mother. When nothing works, he spends time catering to domestic chores for his verbally abusive sister and home schooling Jamb candidates. These jobs hardly satisfy Akande, so when he gets fired from his teaching job, and loses his girl, he decides to travel to Kaduna with the hope that he will receive N150,000 cash grant for cattle farming. 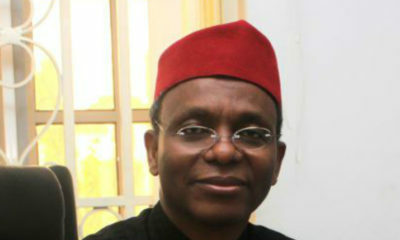 In Kaduna, he decides to teach children in a community where education is luxury, but hope is dashed again when the government scheme is cancelled. With the help of social media, and a clearer perspective of the benefits that exist away from Lagos for an Animal scientist, he stays back in Kaduna and becomes his own employer, while also empowering others with new strategies of getting online attention for businesses in such small communities. Asurf Oluseyi, the AMVCA winning director of Hakkunde allows the spirit of activism trail each of his productions. In ‘Through Her Eyes’ his collaboration with Nadine Ibrahim, Asurf and Nadine lend their artistic experience to the fight against child terrorism. In ‘Hell or High Water,’ the reality of the sexuality of a pastor is explored. Hakkunde is his advocacy for entrepreneurship. Akande, our main character hits it big and TV stations scramble to book an interview with a man that was once on the waiting list. The only reason they require an interview is because his story will serve as inspiration for many others. The reason interviewers went after Akande is directly linked to the reason the filmmakers created Hakkunde – which is, to inspire youths to move for a difference by considering opportunities where we would regularly not look. Hakkunde is a testament of new opportunities that exist in the age of new media; after all, it follows a man’s inability to find a job due to the course studied at school, and how social media does not help at first, but finally plays a part in his success. The style adopted by the filmmakers gets complicated in some scenes. Among the many complications is an extravagant dance scene, and the inconsistency with subtitling. However, youths will connect with this story because the majority of Nigerian Youths are trying to find a means of sustenance. Inspiration is manipulative and occurs at uncertain times, making a film is a strategic way to inspire. Films offer a great value of inspiration on different levels and while there are enough people preaching about the value of independence and being self-employed, to see this unveiled artistically gives the advocacy for entrepreneurship an edge. It is definitely a different strategy from standing on a podium and telling stories of how ‘I made it, and how you can make it too’. 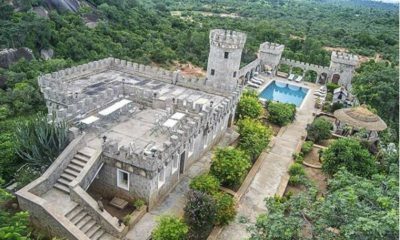 Entrepreneurship is a sure path for more job creations and Hakkunde might offer the right inspiration to look elsewhere, search new terrains and aspire to create greatness where impossibilities peak.